The delicate Flower, Butterfly, Gemstone, and Ladybird- shaped pressed powder designs, embossed on a pastel background, are inspired by Victoire de Castellane’s famous Dior jewelry collection. 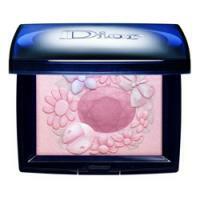 Shimmery light pink color in the middle of the palette is best for a cute blush. The blue, green and yellow are in fact iridescent shades. They don’t look like much but when applied on the skin they take on an iridescent shimmer when the light hits it. The base pink/peach color is a great shimmery highlighter. I think the colors will suite only the fair skin and I can’t imagine it working on someone with a tan, as I’d expect it might only show up as shimmer. This exclusive, limited edition Dior Flower Blossom pressed powder compact, with its delicate play of pink, lilac, rosy beige, peach and apricot shades, was created especially to illuminate and accent every Dior Spring fashion look. Sweep your brush across one or more of these luscious hues to add an ethereal finishing touch of Springtime radiance to your complexion.